Icaps vitamins are made by the company Alcon, a global company based in Hünenberg, Switzerland. There are three different formulas of these eye vitamins. ICaps AREDS Formula, ICaps Lutein and Zeaxanthin Formula and ICaps Multivitamin Formula. ICaps® AREDS Formula contains the same dosage of vitamins and minerals used in the Age-Related Eye Disease Study (AREDS) by the National Eye Institute (NEI). This study showed that high levels of antioxidants and zinc significantly reduced the risk of age-related macular degeneration (AMD) by about 25% in patients most at risk for age-related vision loss. The AREDS combination of vitamins and minerals was also found to be effective in delaying the progression of AMD. This Icaps AREDS Formula Eye Vitamin and Mineral Supplement includes 120 softgels with a recommendation of 2 soft gels/day. One bottle will last you two months. The ICaps Vitamins with Lutein & Zeaxanthin has antioxidants and zinc, including lutein and zeaxanthin. It is made for people at risk of age-related eye conditions. ICaps® Lutein & Zeaxanthin Formula may also be appropriate for people with frequent exposure to sunlight. Doctors believe lutein and zeaxanthin may protect eyes by reducing the damage caused by free radicals. # Time-release formula allows the ingredients to dissolve gradually for better absorption. The ICaps Lutein & Zeaxanthin Formula is the only major ocular antioxidant supplement that has a delayed release formula. This delayed release allows the ingredients to dissolve gradually which leads to better absorption. 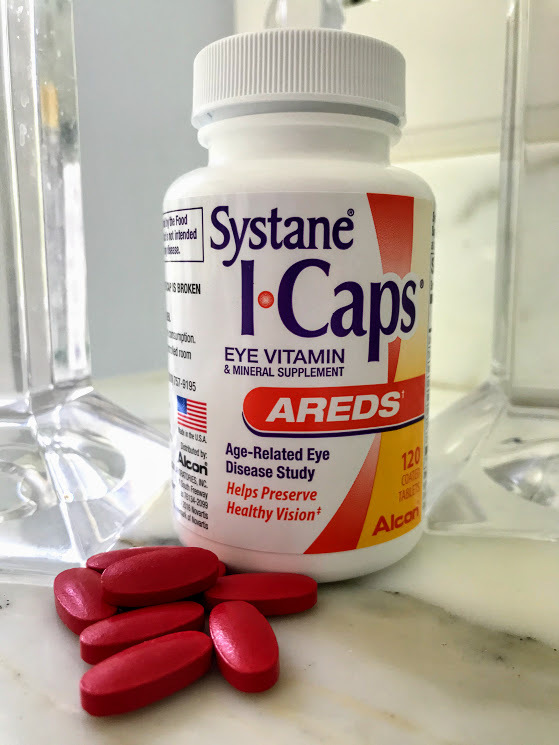 The Icaps Eye Vitamins, Multi-vitamin Formula with Lutein & Zeaxathin offers convenience by combining the eye vitamins from the AREDS study plus the vitamins that are important to the rest of our body in a multivitamin. It also includes high levels of lutein and zeaxanthin. The ICaps® MV are coated and are a delayed-release tablet which provides better absorption with less stomach upset. The recommended dosage is two tablets taken twice a day.